Tibet overland tour begins with an exciting flight with amazing aerial views. You can see some of the highest mountain peaks in the world on this flight. The flight gives you a glimpse of the fabulous country that you are visiting. Once you land, your journey gets more exciting with a drive through the high desert plateau of Tibet. During your tour, you can enjoy panoramic views, visit caves, and ancient monasteries. You also pass through fascinating palaces, ancient markets, and amazing turquoise lakes. During your tour, you also get to discover the ancient Buddhist culture and the Tibetan way of life. This 8 days Tibet overland tour gives you a glimpse of the magnificent culture, historical grandeur, nature and life of Tibetans. You make your way through green meadows, river gorges, snow-capped mountains, and waterfalls. You also get a breathtaking panoramic view of incredible Himalayan ranges including Mt. 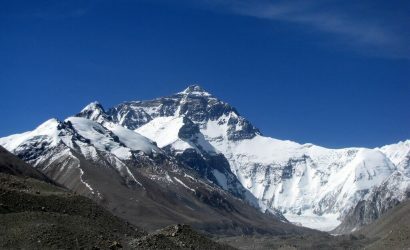 Cho Oyu (8201m), Mt. Xishapagma (8012m) and Mt. Everest. You will visit all the must-visit places in Tibet like Lhasa, Gyantse, and Shigatse. This short and amazing tour will leave you wanting more. Trans-Himalaya flight from Nepal to Lhasa. For any further queries or questions related to Tibet Overland Tour from Nepal or any other tour or trek in Nepal and Tibet, feel free to contact us. Tsedang: 3100m Flight Duration: 1 hour 20 mins. Kathmandu in Nepal is the only international city in the world that has direct flights to Lhasa. On the flight, you get amazing aerial views of Mt. Everest and other high mountain peaks on clear days. 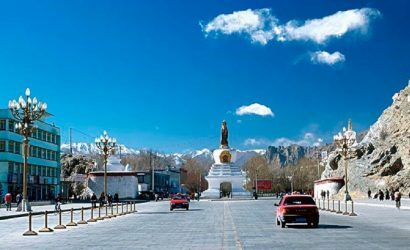 Once in Lhasa, the tour representatives of Tibet will pick you up and then you drive onwards to Tsedang. Located by the Yarlung Valley, Tsetang is the capital of Shannan Prefecture. It's reputed as "the cradle of Tibetan Civilization. Samya Monastery: You can take a boat ride along the Yarlung Tsangpo River to visit Samya Monastery. Today you leave for Gyantse via Samye. Driving on the dirt road you reach a bridge to the south side of the Yarlung Tsangpo river. This takes you to Samye. Here on, the scenery is beautiful and desert-like with many sand dunes. After crossing the Yarlung Tsangpo river, you will see the ferries that took you to Samya Monastery. You will also drive over 2 high passes- the Kampa La (470m) and Karo La (5050m). From here, you travel to Gongkar. Here you take the Friendship highway, Traduka. You stop here for lunch. This valley has many restaurants and cafes to choose from. From here, you continue your drive through the Desert Scenery to reach Gyantse. Gyantse is an old Tibetan Town with a backdrop of magnificent 14th-15th-century fortresses and temples. Here, you can visit the Pelkhor Chode Temple, which served the Gelug Sakya and Buluk orders. You can also visit the Kumbum Stupa. This stupa is an architectural masterpiece built in the style of 108-sided Mandela. It is the most revered stupa in Tibet and houses 112 chapels of which only 23 are open to the public. After breakfast, you will take a 2-hour drive to Shigatse. It is the second largest town and one of the first towns visited by westerners in Tibet. Once here, you can go sightseeing or relax at your hotel or in one of the many restaurants, cafes, and spas in the city. Tashilumpo Palace: It was once the home of His Holiness the Panchen Lama. The Panchen Lama is the second highest spiritual figure in Tibet after His Holiness The Dalai Lama. There are 39 amazing chapels inside the Palace. If you follow the northern Highway, it is the shortest road between Shigatse and Lhasa. You pass through Rinbung County and Nyemo County and follow the road to Yarlung Zangbo River Valley. From here, you follow the main route along the valley to reach Lhasa. The highway offers a spectacular view of the Tibetan Plateau and “Yarlung Tsangpo” river. Potala Palace: A striking landmark, it was once the winter palace of the Dalai Lama. Now it is a museum and still an architectural wonder. Jokhang Temple: Built-in 647 A.D, it is a spiritual center for the Tibetans. Barkhor market: Great place to sip a coffee, watch the life of the locals and shop for souvenirs. Drepung Monastery: Once the biggest monastery of the world with over 10000 monks. Norbulingka: Once the summer palace of the Dalai Lama. You will then transfer to the airport 3 hours before your international flight. 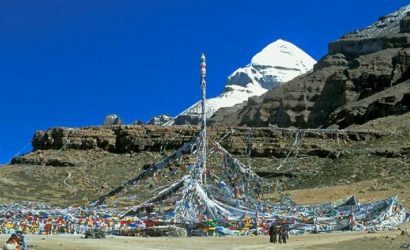 What are the Permits Required for Tibet Overland Tour from Nepal? When is the best time to do Tibet Overland Tour? You can do Tibet Overland Tour throughout the year except for mid-February to March. This is the law set by the local Government in Tibet. The local Spring season (April and May) and Autumn season (September, October & November) are the best seasons to do this tour. These seasons see dry, clear weather along with moderate temperature. You can enjoy the beautiful landscapes and get fabulous, clear views of the mountains during these months. The local winter season (December & January) are great for budget travelers. The cost for almost everything is on discount during these months. The local summer season is also monsoon in Tibet. The roads can be muddy, wet or blocked due to the weather conditions. Hence, you can avoid this season for Tibet Overland Tours. Do I need a guide for Tibet Overland Tour? While visiting Tibet, your tour guide must go with you. In Lhasa, you can roam the cities alone for a few hours yet a guide is mandatory for travels into Tibet. Your tour guide may face fines if you tour alone in other places. Is altitude sickness an issue for Tibet Overland Tour? Yes, Tibet is a high altitude country. Make sure you consult with your doctor before undertaking this tour. What currency should I bring to Tibet? You can bring your local currencies to Tibet. Once here, you can change into the local currency of Chinese Yuan in one of the many money exchange counters. Can I book Tibet Overland Tours alone or as a couple? Yes, you can. But you will join a larger group for the tour. Independent travelers are not allowed into Tibet. What kind of vehicle will the Tibet Overland Tour take place in? Most tour operators use the mini-Toyota for the Tibet Overland tours. This seats around 12 people. The vehicle is not allowed to have more people than the seating capacity.